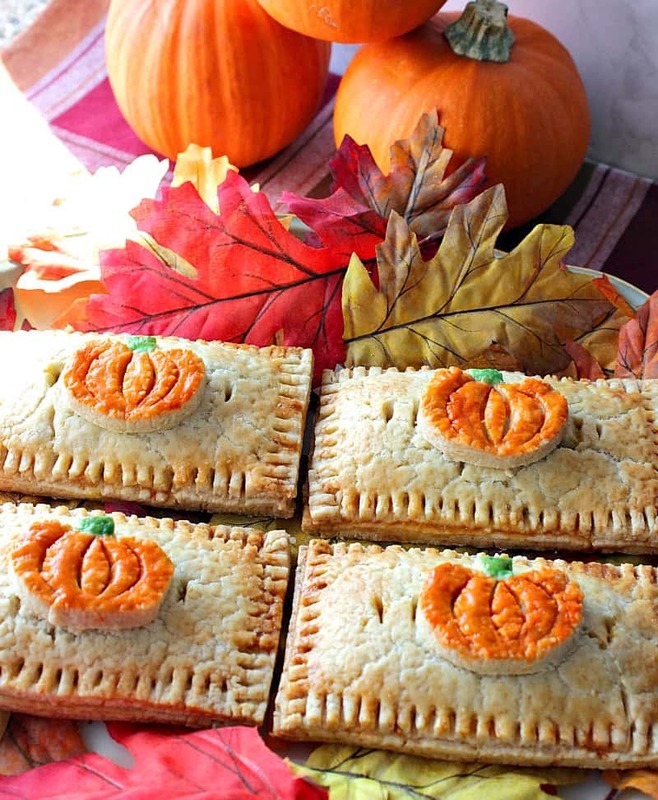 Don’t just serve your family and friends homemade pumpkin hand pies! Charm them first with their looks, and then dazzle them with the taste! After being away from the #SundaySupper movement for a few years now, I’m super excited to be back cooking and baking with this amazing community of food bloggers once again. It feels a lot like coming home to the comforting aroma of something delicious baking in the kitchen, along with a nice warm hug! This week of #SundaySupper is in celebration of all things pumpkin! I hope you’re ready because not only am I sharing my recipe for these charmingly embellished homemade pumpkin hand pies, the #SundaySupper group is bringing you 24 amazing pumpkin recipes, from appetizers, drinks, main courses, and of course desserts. You can find all 24 pumpkin recipes listed at the bottom of this post, so make sure to click on those titles to grab your favorites. Cooking and baking during the holiday season is where I feel I can really let my creative side soar, and it’s the time I’m most excited about being a food blogger. These simple yet charming embellished pumpkin hand pies are a good example of how just a little extra touch can do so much to elevate the charm factor and presentation of an otherwise nondescript hand pie. 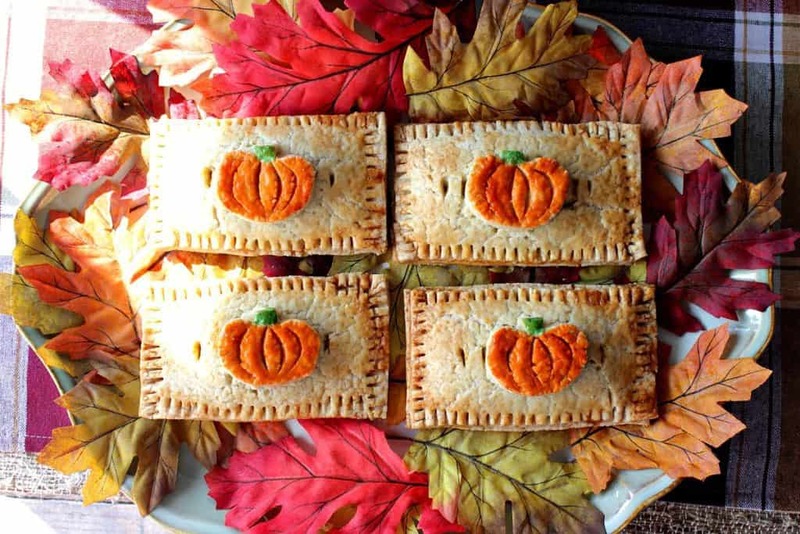 The pumpkin embellishments on these homemade pumpkin hand pies may look like they took a lot of extra time to add, but they only took a matter of minutes and just a drop or two of color. Trust me when I tell you that anyone can do it! You have my word on it! If making your own pie crust scares you (it scares me sometimes too), feel free to use the rolled-up store-bought variety that you can find in your local grocery store’s refrigerated section. The only thing I suggest if you go the route of using store-bought pie crust is that you purchase two boxes of dough (giving you four pie rounds, two per box). This will ensure you have enough dough to make at least eight 4½” x 2½” hand pies (sixteen rectangles total) along with enough dough scraps to make eight pumpkins, for 8 pumpkin hand pies. If truth be told, I don’t always make my own pie crust. There have been MANY times where I’ve used the store-bought variety and came away with some pretty fantastic (and tasty) results. Below are two examples of a few of my most popular posts in which I’ve used store-bought pie crust, so I would never stick up my nose at anyone who uses it. Far from it! 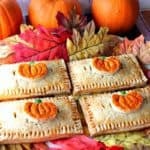 So now that you know you can make these Charmingly Embellished Homemade Pumpkin Hand Pies with or without making a homemade pie crust, there is really no reason to stress over making them. Just make them. Your family and friends will thank you! If you’re ready to begin, let’s start baking the pumpkin hand pies, shall we? If making homemade pie crust, assemble the following list of ingredients and equipment; cold, cubed butter, all purpose flour, granulated sugar, kosher salt, apple cider vinegar, ice cold water, measuring spoons, a food processor, and plastic wrap. If using store-bought rolled pie dough, thaw in the refirgerator, if frozen. In the bowl of a food processor, add the all purpose flour, granulated sugar, salt, and the cold, cubed butter. Pulse the processor until the mixture forms coarse crumbs. Add the apple cider vinegar and ice water to the processor and process just until the mixture comes together into a loose ball. You know the dough is workable if you can squeeze a bit and it holds together in your fingers. Turn the dough out onto the counter and gently divide it in half, forming each half into a disc. Wrap each disc with plastic wrap and chill the dough for at least 30 minutes in the refrigerator. While the dough is chilling assemble the ingredients and equipment needed to make the filling; pumpkin puree, brown sugar, ground cinnamon, ground ginger, ground allspice, nutmeg, pure vanilla extract, cream cheese, 2 egg yolks, 1 egg, salt, a saucepan, spatula, wooden spoon, 2 small bowls, 1 large bowl, a grater, and gel food colors (orange and green). Add the pumpkin puree, brown sugar, cinnamon, ginger, allspice and nutmeg to the saucepan. Heat the mixture over medium/low heat, stirring occasionally, for approximately 5 minutes. The reason for doing this is to remove some of the excess moisture from the filling. If it’s too wet it will make the pie crust soggy. Remove the pumpkin pie filling to a large bowl and add 4 ounces of cream cheese, and 1 teaspoon vanilla. Stir well to combine the pumpkin pie filling with the cream cheese. Once the mixture has cooled slightly whisk in 2 large egg yolks (reserving the whites for another use). When the mixture is fully mixed, chill the filling in the refrigerator for at least 30 minutes. Meanwhile, crack an egg into a small bowl along with 1 tablespoon water. Mix well and divide the egg mixture into three smaller dishes. Leave one egg wash plain, without color. Add a few drops of each color (orange and green) into the remaining egg wash dishes and mix well to combine. Set aside. Once the dough has chilled for at least 30 minutes roll it out onto a lightly floured surface to approximately ¼” even thickness (although thinner is always better). If using store-bought dough, start here. To make the cookie template, use the cardboard from the back of a pad of paper and measure it out a 4½” x 2½” rectangle along with a 2″ in circumference free-form pumpkin. Cut out the two templates. Use a paring knife to carefully cut out 16 rectangle shapes from both the the chilled pie dough discs, making sure to re-roll the dough scraps as needed. Place the cut rectangles onto parchment lined baking sheets. Place approximately 1½ tablespoons of the chilled pumpkin pie filling into the center of 8 rectangles. Use water and a paint brush (optional) to run a light trail of water around the outer edge of each of the 8 bottom pie crusts. Top each bottom filled crust with a top crust and press lightly to adhere the two pieces of dough together. Use the tines of a fork to press a decorative border around each hand pie. Set the pies aside. Roll out the remaining scraps of dough. Use a paring knife and the pumpkin template to cut 8 pumpkin shapes, making sure to score the crescent lines on each pumpkin. Paint a liberal coat of the colored egg washes onto each pumpkin, making sure to clean the paintbrush with water before switching colors. Brush each hand pie with a light coating of the plain egg wash and then press one of the painted pumpkins into the center of each hand pie. Use a paring knife to gently slit a few steam holes into the top of each pie and bake them in a preheated 350 degree oven for 30-35 minutes or until golden brown. 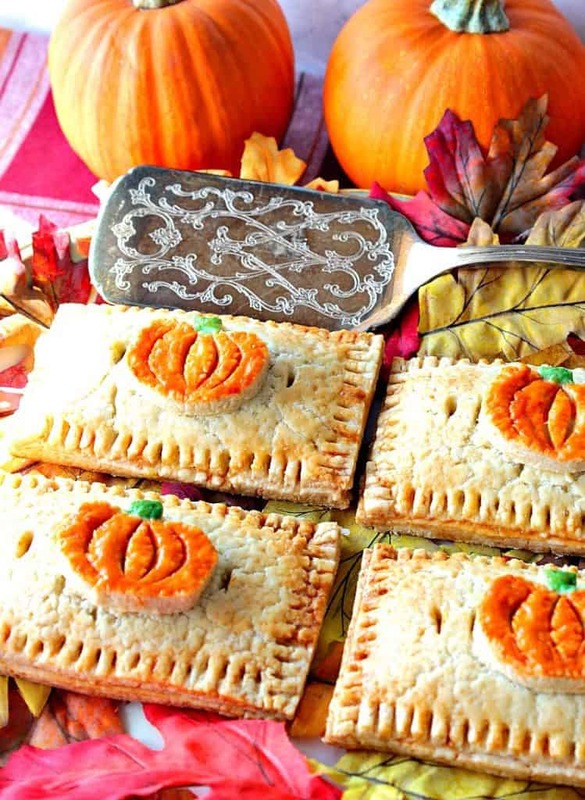 Don't just serve your family and friends homemade pumpkin hand pies! Charm them first with their looks, and then dazzle them with the taste! Place the flour, sugar, and salt into the bowl of a large food processor. Pulse a few time to mix. Add the cold, cubed butter and pulse again until it forms forms coarse crumbs. Add the vinegar and ice water to the processor and process just until the mixture comes together into a loose ball. *Note - If you can squeeze a bit of dough in your hands and it holds together, you've got the proper consistency. Turn the dough on a work surface and gently work it into a loose ball. Divide the dough into two even sized discs and wrap each disc in plastic wrap. Chill the dough in the refrigerator for at least 30 minutes. *Note - You can make the dough well in advance of when you're baking the pies and keep it in the refrigerator until your ready to roll. In a medium saucepan over medium/low heat, stir the pumpkin puree, brown sugar, salt, cinnamon, ginger, allspice and nutmeg occasionally for 5-7 minutes. This will evaporate some of the water so the filling won't make the hand pies soggy. Transfer the pie filling to a large bowl and add the softened cream cheese to the pumpkin mixture. Stir to completely incorporate the cream cheese with the pumpkin pie filling. Add the egg yolks and vanilla extract to the bowl and stir well to combine. Refrigerate the pumpkin filling in the refrigerator at least 30 minutes. In a small bowl, stir the remaining egg and 1 tablespoon water. Divide the egg into three small bowls. Add a few drops of orange color to one of the small bowls, and a few drops of green color to another of the small bowls. Mix well to combine. Leave the third egg wash plain with no color. Set the egg washes aside. On a firm piece of cardboard (I used the cardboard on the back of a pad of paper), measure out a 3½" x 2½" rectangle, and free form draw a 2" pumpkin on the cardboard. Note - These DO NOT need to be perfect!! Cut the templates from the cardboard using a scissors and set the templates aside until you're ready to cut the pie crust. Remove the dough from the refrigerator and allow to warm slightly. Working with each disc of dough at a time, roll it out onto a lightly floured surface until the dough is approximately an even ¼" thickness. Lay the cardboard rectangle template on the pie dough and use a paring knife to carefully cut out 16 rectangles (you'll be using both dough discs for this and have to re-rolling the scraps for the full 16 rectangles). Place 8 rectangles onto one parchment lined baking sheet and 8 rectangles onto a second parchment lined baking sheet. Re-roll the leftover scraps and cut out 8 pumpkins using the pumpkin template and set the pumpkin pie pieces aside. Remove the pumpkin filling from the fridge and place approximately 1½ tablespoons of pumpkin pie filling into the center of 8 rectangles. Use a light touch of water around the edge of each filled pie crust bottom and carefully add a top rectangle to the filled bottom crust, pressing the edges lightly to seal. Complete that same step to complete all 8 hand pies. Use a fork to firmly press the edges of the hand pies to seal and make a decorative border. Brush the plain egg wash scantly over the top of each hand pie. Use the colored egg wash and a clean paint brush to generously paint the orange and green onto each pumpkin cut out, making sure to wash the brush with clean water between changing colors. Gently transfer one colored pumpkin onto the top of each hand pie, pressing lightly to adhere. Use the paring knife to gently slit two steam holes into the top of each hand pie. Bake the pumpkin hand pies in a preheated oven for 35-40 minutes, or until they nicely golden brown. Remove to a wire rack and cool completely before serving. And now, without further ado, here are all 24 pumpkin recipes from the #SundaySupper group. I don’t know about you, but I’m very excited to check out each and every one, and I hope you do too! I hope you’ve enjoyed these fabulous fall pumpkin recipes as much as we’ve enjoyed bringing them to you. If you have any questions, please don’t hesitate to contact me directly or leave me a comment in the comment section. It is always my pleasure to answer any questions you may have for me as soon as I possibly can. Absolutely beautiful, Renee! I love your handiwork and I know these will taste great too! Thank you so much, Cindy! I really appreciate it! These are so fun, Renee! 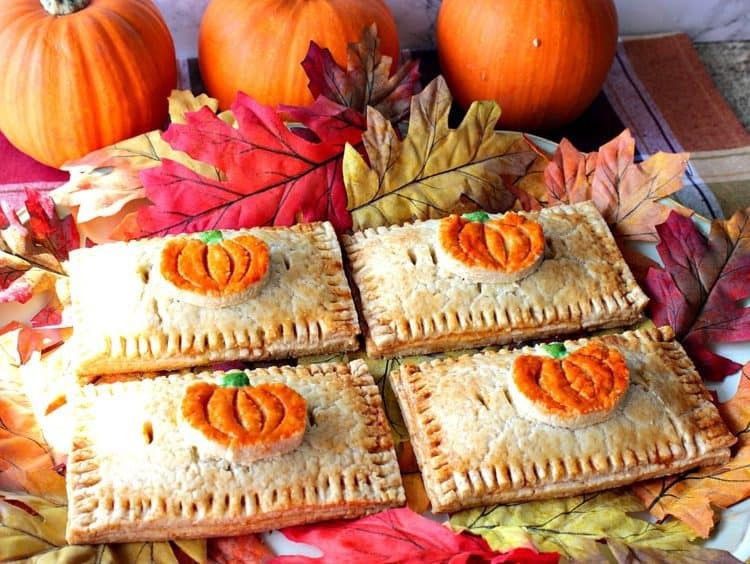 I never thought of making pumpkin hand pies, but now they’re a must make!! Glad you think so, Liz. Thanks so much! These hand pies are, indeed, charming. I love what you do with pie crust. Very nice! Thanks, Eileen! You’re very sweet! Welcome back to Sunday Supper! 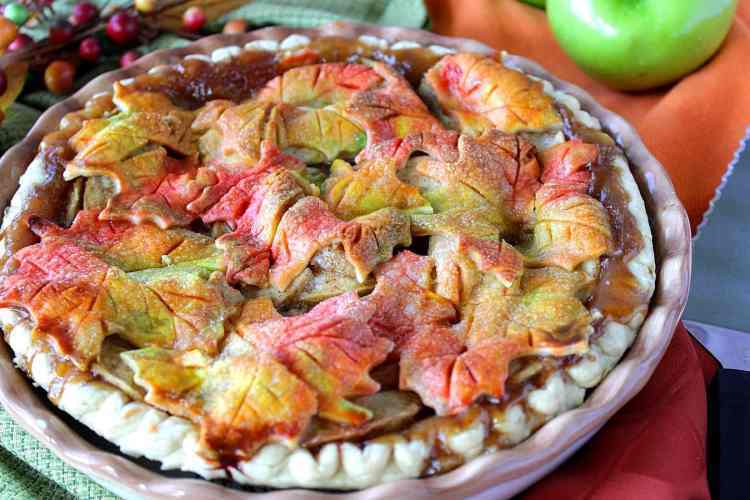 You sure made a splash with these pies that are almost too pretty to eat. Almost. Glad you’re back with Sunday Supper Renee. Your dishes are always so creative. I’m happy to be back, Wendy! Thank you so much! 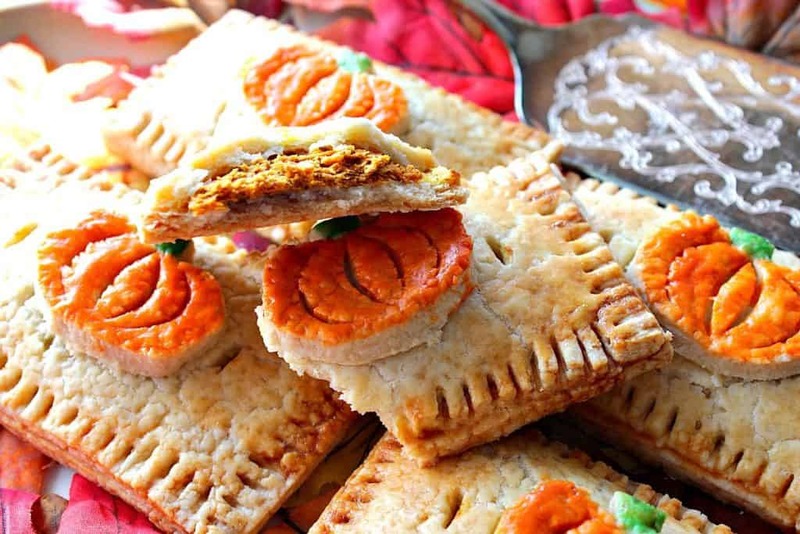 I love these pumpkin hand pies!! They are perfect for this fall!!! Thanks, Jocelyn. I’m glad you think so. Awww. That is so sweet! Thank you, Nichole! I absolutely love how you put the artist to work in your baking! These are absolutely adorable and would be a perfect Thanksgiving dessert! I don’t think that I’ve ever seen a Hand Pie look quite this good! That is so sweet of you to say. Thanks so much. Glad you like them! 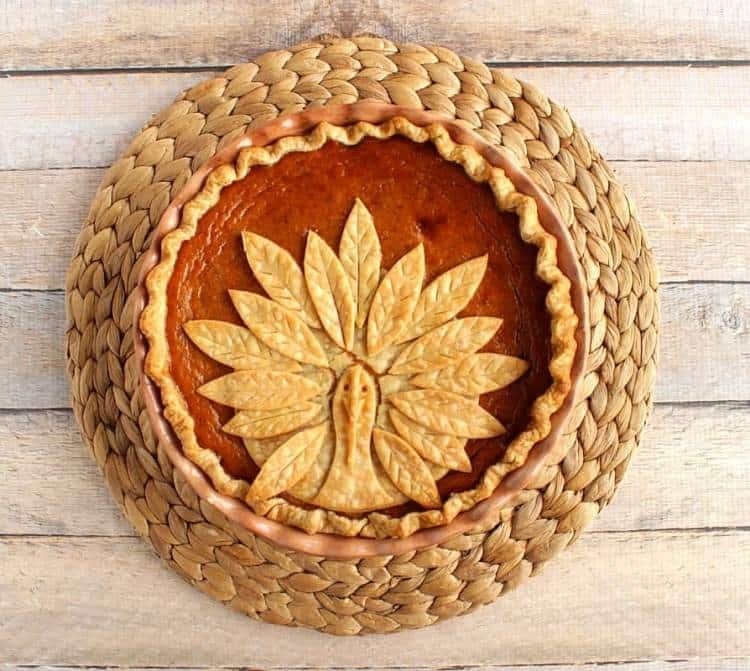 How amazingly creativ those little pies are, with a funny pumpkin on top. My kids will enjoy it on holidays! I just love the creative decoration on your hand pies, they look amazing! Such amazing handiwork.